Summary: This photograph shows inmates A.B. Treadwell, prisoner #6949, and Phillip Searls, prisoner #9065. A.B. Treadwell was received at the Kansas State Penitentiary on May 14, 1894 from Lyon County, Kansas for burglary, escaping prison and larceny. 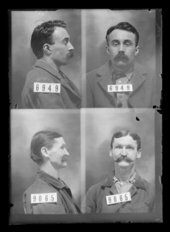 Phillip Searls was received at the penitentiary on October 6, 1899 from Oklahoma for larceny. Varient spelling of his names includes Phillip Searls.